President Jimmy Carter holds negotiations for a peace treaty between the Egyptians and the Israelis. The result was an agreement not to make war, to negotiate the refugee problem, Israel received access to the Suez Canal and would also receive its oil supply from Egypt. 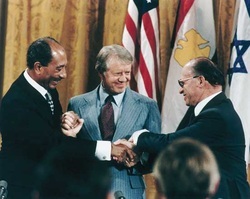 View Camp David Accords and over 3,000,000 other topics on Qwiki.